Creamy, gooey, and oh-so-delicious, peanut butter might be one of our favorite spreads/snack foods. And while we're always trying to create cool new concoctions with this creamy condiment, we often find ourselves settling for a spoonful on our way out the door. 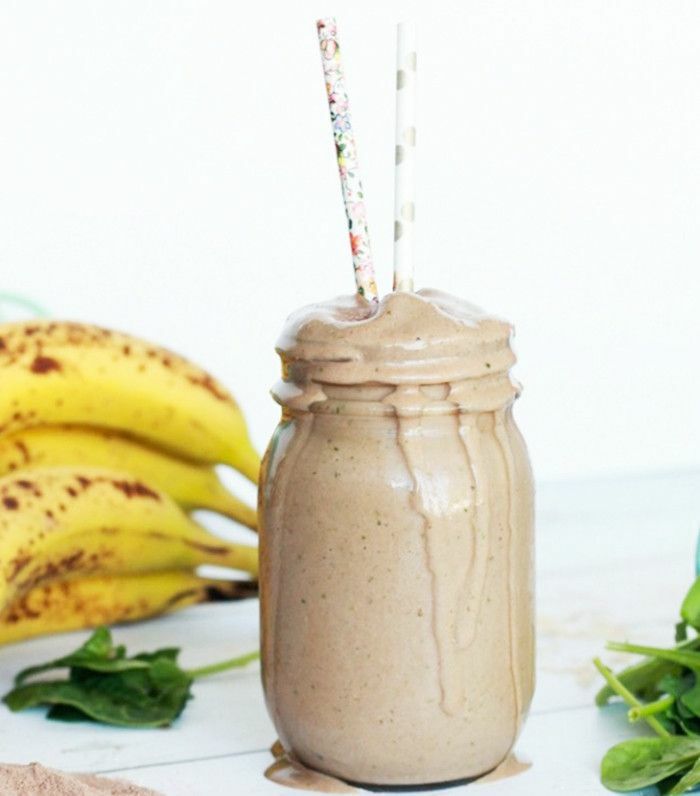 To kick this bad habit, we reached out to a bevy of nutritionists for the healthiest peanut butter smoothie recipes to inspire us to get cooking, if you can call it that. "Peanut butter is great because it's smooth, creamy, and the fat content helps to promote satiety while adding fiber that's good for your heart and digestion,” says nutritionist, Isabel Smith, MS, RD, CDN. And it also happens to be the perfect ingredient for your morning smoothie, as Alissa Rumsey, MS, RD, CDN, says it "blunts the blood sugar rise that can come from a smoothie with a lot of fruit." For the quick, easy, and healthy peanut butter smoothie recipes according to nutritionists, keep on reading. Peanut butter has a tendency to make smoothies heavier. To lighten it up, Farah Fahad, MS, RD, dietitian and founder of The Farah Effect, recommends this delicious peanut butter delight. To create this smoothie, combine 3/4 cup unsweetened vanilla almond milk, like Califia Farms Unsweetened Almond Milk ($4), a half-cup of frozen strawberries, one frozen ripe banana, half a teaspoon of vanilla extract, one tablespoon roasted creamy peanut butter, one tablespoon ground flaxseed, one Medjool date, and a sprinkle of ground cinnamon if desired. If you're looking to drink a smoothie as a meal replacement, Rumsey says this peanut butter banana oatmeal recipe is a great option, as it provides protein via Greek yogurt, healthy fat from peanut butter, and both whole grains and fiber from oatmeal. Pro tip: Rumsey suggests looking for peanut butter that has only two ingredients—peanuts and salt. Smith says that a well-rounded smoothie is composed of one fruit, a vegetable or two, one protein source, and a healthy fat like peanut butter. For a balanced morning smoothie, she recommends adding a healthy fat, like Justin's Honey Peanut Butter ($10) to your classic green smoothie. In order to do this, Smith says to follow this recipe in regard to the greens so that you get energy from B vitamins as well as magnesium. Then, swap out the almond butter for peanut butter to promote satiety and balance blood sugar. Satisfy your sweet tooth with Fahad's healthy chocolate peanut butter cup smoothie, which is composed of 3/4 cup unsweetened vanilla almond milk, one frozen ripe banana, one tablespoon cocoa powder, one tablespoon roasted creamy peanut butter, and one teaspoon Manuka Doctor Manuka Honey ($22). Place the ingredients in your blender, blend away, and enjoy!